ALL MY MURAMATSU PRICES* ARE AT 25% DISCOUNT AND MORE!!! EX MODEL – solid silver head joint, silver plated. GX MODEL – solid silver tubing, embouchure, rings, ribs & posts, silver-plated keys. DS MODEL – solid silver. SR MODEL – solid silver, soldered tone holes. ALTO FLUTE – All solid silver. all my-prices above are tax-free in EURO currency and are subject to change without notice, unless already invoiced. For EC-countries add 21% tax. please note that prices at my website do not necessarily reflect on instruments that are test-played by a buyer in my shop and/or instruments that are sold with MY EXTENDED WARRANTY PERIOD AND SERVICE. The head-joint (behind the lip) and foot-joint (on the rib) of a Muramatsu flute bear the last 2 digits of the serial number of the flute (main body) and I sell them only as such. Beware of shops who mix-up models!!! * My prices to client’s-order-to-factory I keep very close to the chest. They are in fact the price I pay to Muramatsu, plus a fixed and reasonable checking-and handling fee. 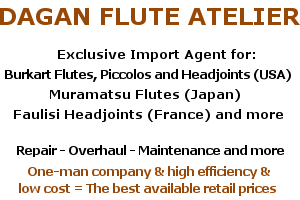 You are surely aware of the price-war out there in the flute world but – the good news is – that my price policy for the Muramatsu top-models assure you the best price you can possibly get (worldwide including at the Muramatsu shops). REMEMBER DEAR FLUTIST that at your purchase, I serve YOU in the first place. As a Muramatsu expert (see About Dagan) – yet independent – my meticulous check of the flute before delivering to you will not let material/s- and/or production- and/or finishing failure/s pass through! (And believe me, they do occur during production!). I will fix it or return the flute to the factory for replacement or, you will get your money back. The warranty and after sale service through me is rock-solid. Compromising will not occur! “BUT I WANT TO BE ABLE TO CHOOSE MY FLUTE…” YOU WILL SAY… There is something to it, but, with Muramatsu – the only flute maker able to make flutes/head joints for 99% identical – and my pricing-policy that save you MANY thousands of Euros, you will be able to choose an additional gold head-joint of any maker you will decide, enrich your sound potential and still ALL-TOGETHER remain at a bargain price. So, honestly, there is something to my advice too. Contact me for a free advice or price offer BEFORE you make a decision! For flutists who aren’t familiar with the above flutes description codes I list them here below. A45 = pitch A=445. If not specified it is A=442. C.O.A.= the flute is after clean, oil & adjust. General conditions registered at the Amsterdam Chamber of Commerce, no. 2367. Trade register 204776. VAT no. NL 821137918B01.